It’s really sad to see how much furniture gets thrown out. It’s such a waste and most of the time there’s really no need for it. Very seldom is a piece of furniture beyond repair (if the wood itself isn’t severly damaged) and most wood can be re-coloured and finished in almost any way you could want. Here’s a great example demonstrating why you need to think twice about throwing your furniture away. Take a look at how awful the top of this Mahogany sideboard looks. There are heat marks, water marks, along with all kinds of other damage and stains. It may look completely wrecked but it is in fact, very straight forward to repair. I striped all the existing finish, re-stained and traditionaly French Polished the top. The important point is that there was nothing actually wrong with the wood, the damage was all in the finish, which is not a major job to replace; it took me one day. It’s impossible to buy this quality of wood any more, so it would have been a huge shame to have thrown the item away. If looked after properly, it should last for decades to come. It’s not always just about repairing wood. Many wooden items get thrown out because the owner no longer likes the colour or finish. Maybe the item dosen’t match the new design of surrounding furniture or room decoration. 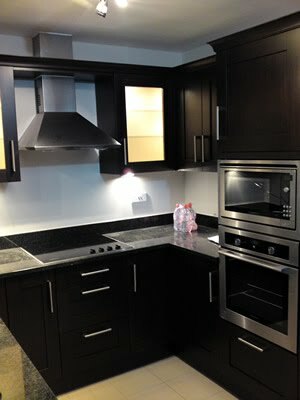 This next example shows the images after we completed work on a kitchen. The kitchen was a light, almost yellow, maple colour which had a slightly dated look to it. We spent just a few days re-staining and polishing the kitchen units to a darker, more sophisticated colour and finish, saving the client thousands of pounds in replacement costs and weeks of inconvenience.The options really are endless. From super glossy to soft matte, white to black and every colour in between. So before you replace that piece of furniture, kitchen, floor or door, look into the options for changing the finish or colour first and if the wood seems damaged beyond repair, like the Mahogany top in the above example, there usually is a way to fix it.